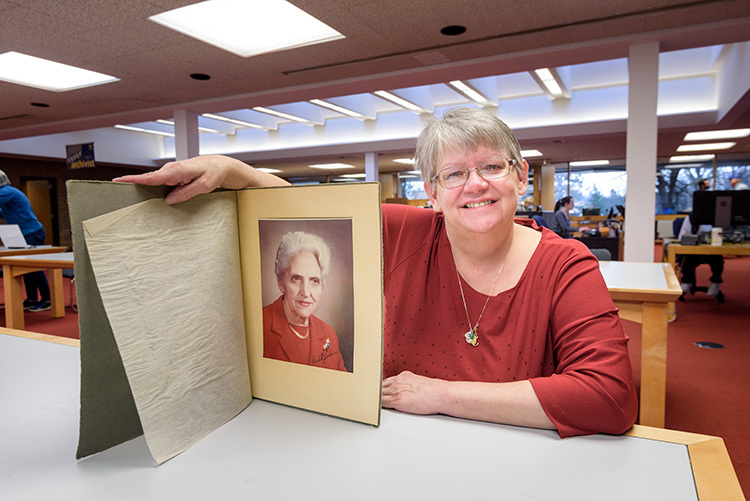 ﻿ From Cold War to travel ban, Ann Arbor-founded exchange program promotes "one-on-one diplomacy"
Deb Anderson with a photo of her grandmother and Youth For Understanding Founder Rachel Andresen. Photo taken by Doug Coombe. The Whitmore Lake resident heard many stories growing up about the "ragtag group" of 75 German teenagers her grandmother, Rachel Andresen, brought to Michigan for a year as YFU's first group of foreign exchange students. Andresen was director of the Ann Arbor-Washtenaw Council of Churches at the time, and she was inspired to help rebuild Europe after traveling there and seeing the destruction in the late '40s. YFU has since grown to become one of the largest intercultural exchange programs in the world. With operations in more than 60 countries and 4,000 annual participants globally today, the nonprofit organization has helped exchange 250,000 students worldwide to date. When you factor for family members and classmates those students interact with, it's reasonable to estimate millions of people have been impacted by YFU over the years. Its United States headquarters moved from Ann Arbor to Washington, D.C., in the '70s, but YFU still has a strong local presence. In recent years the organization has also made some new local connections, tapping local leadership for its board of trustees and partnering with the University of Michigan's (U-M) Tauber Institute to help improve its operations. Read the full article.